NFL free agency continues to bubble away in the background, but most signings of significance have now been made, and there is little more to happen as teams turn their attention towards the draft. Quarterback, though, is a unique position in today’s NFL, and the rules are a little different. A passer that has ever shown an ounce of ability to start, play well and win games in the NFL will get an endless sequence of chances to rediscover that magic, because teams just can’t find reliable starters easy enough. The list of NFL quarterbacks still on the open market would be cast aside if they were equivalent players at any other positions, but because they are QBs, most, if not all of the top eight or so remaining will find a new team for the upcoming season. 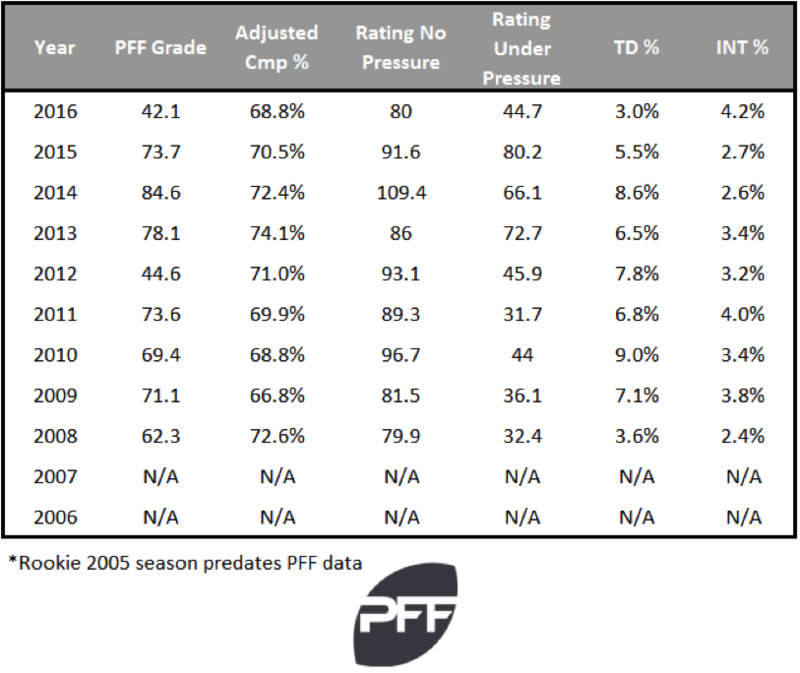 Cutler has typically been quite accurate over his career, topping 70 percent in adjusted completion percentage eight times. His touchdown percentage has also typically been high, but his interception rate can also rise to meet it. The fall-off in 2016 of his numbers is evident, with drops across the board. His interception rate and play under pressure is typically the flip-side of that coin, and has been his career weakness. 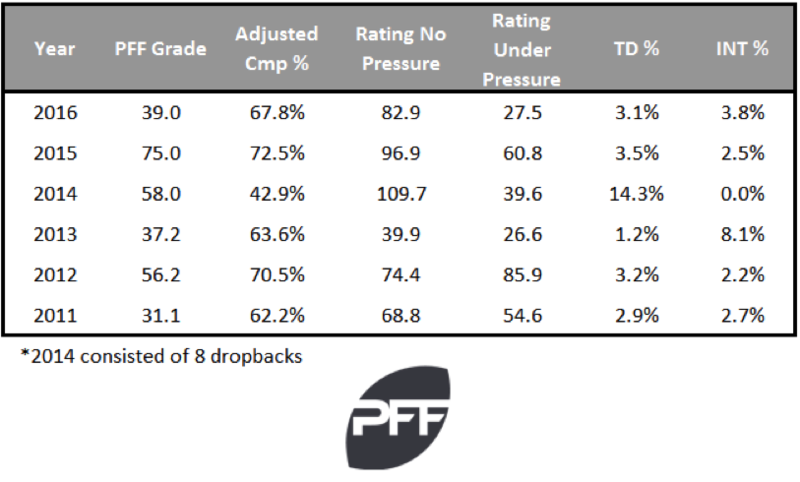 His passer rating under pressure has been disastrous at times, with three years under 40.0. Gabbert has never topped 3.5 percent in touchdown percentage in a season that consisted of more than eight dropbacks. Colin Kaepernick actually has the second-best career interception rate in NFL history. 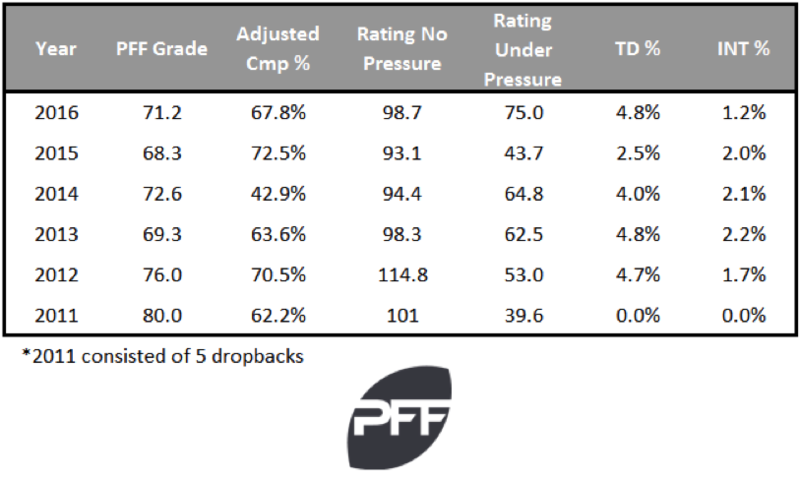 His passer rating when kept clean in the pocket is usually excellent—above 90.0 in every season. Kaepernick’s touchdown percentage has always been respectable—over 4 percent in four of five seasons with meaningful snaps. 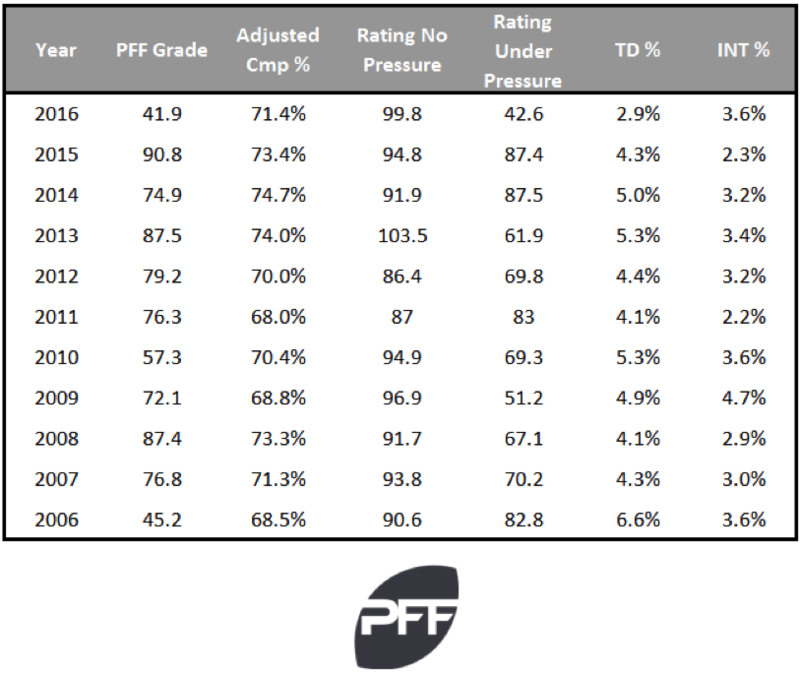 RG III’s career year was his rookie season, and everything has been downhill from there. 2014 showed parts of that excellent rookie season, but it was without the big plays, with a TD percentage more than 3 percent lower than his rookie season. 2016 saw Griffin less efficient when kept clean in the pocket, with a passer rating of just 72.4 in a new offense. 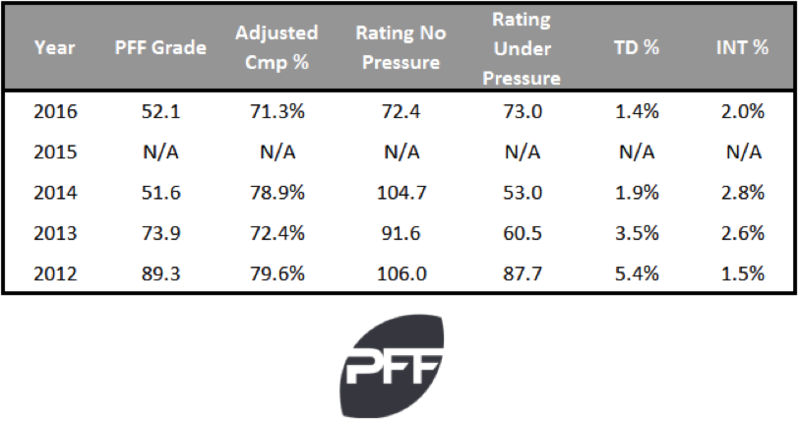 Case Keenum has typically been good when kept clean, but a disaster when pressured, with a peak passer rating of 51.7 under duress. He has been accurate, with his past three seasons topping 70 percent in adjusted completion percentage. McGloin’s career is just 277 pass attempts old, or less then half an average total for the 2016 season. He has a good touchdown rate, but has an interception rate to match it. If McGloin is an unknown quantity, Daniel is even more so, with just 78 career passes to his name in regular-season action. Daniel has been accurate, with 73.9 percent of his passes hitting their mark.